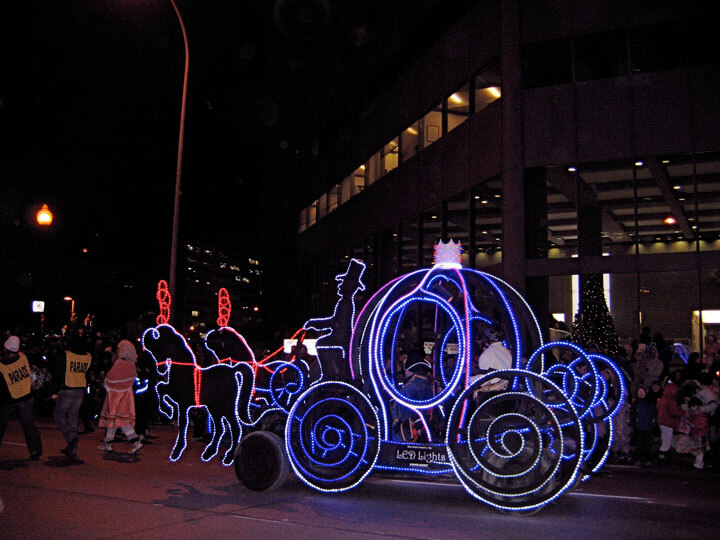 Darkness arrives in Winnipeg at around 4:30 in the afternoon now and Saturday's Santa Claus parade began at 5:00 so this is a night parade with lighted floats and displays. The parade began near the CBC building on Portage Ave. and made its way east turning onto Main and going only a couple of blocks before turning off to disbane. We were camped across from the MTS building with family, funny hats and good spirits to deal with the -5ºC evening. Fortunately the wind was not as severe as it often is at Portage and Main and we survived. Before the parade candles and candle holders were handed out to the children along the whole route of the parade while many folks were wearing lighted buttons and hoops around their necks. It was a cheerful crowd, but there were a lot of people crammed into that small section of the city. The surprising thing about this parade was that there were no live music, no marching bands not even a bunch of drummers. Though the large corporations and employers in the city were represented there was no sign whatever of the massive retail establishment. It was just about 7:00 when the parade's end and the waving chattering Mr. Claus made his way by us.